Cyclosporin A (CsA) is used widely as an immunosuppressive agent, but it induces osteoporosis as a prominent side effect. 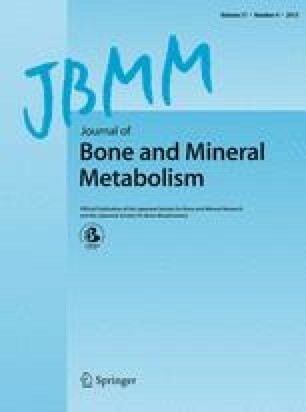 To elucidate the mechanisms involved in CsA-induced osteoporosis, the effects of CsA on bone metabolism were investigated in a rat experimental model. Fifteen-day-old rats were fed a powdered diet containing or lacking CsA for 8–30 days. Analysis was performed by micro-computed tomography (μCT) and light microscopy to examine histomorphometric changes in rat tibiae on days 8, 16, and 30. Plasma parathyroid hormone (PTH) and osteocalcin (OCN) levels were determined by enzyme-linked immunosorbent assay (ELISA) on days 8, 16, and 30. The expression of OCN, osteopontin (OPN), and cathepsin K mRNAs in tibial bone marrow was examined by Northern blot analysis on days 8 and 16. Although no significant differences were observed in tibial length during the experimental periods, or in histomorphometric parameters on day 8, an apparent decrease in bone volume was observed in the CsA-treated group after day 16. Histologic analysis showed that the number of osteoblasts and osteoclasts on the surface of trabecular bone in the CsA-treated group had increased significantly on day 16. Plasma PTH and OCN levels in CsA-treated rats were significantly higher than those in control animals on day 8. Northern blot analysis revealed that the CsA-treated group showed an increase in the expression of OCN, OPN, and cathepsin K mRNAs on day 8 compared with the controls. These findings suggest that bone resorption in CsA-treated rats is induced by high-turnover osteoporosis and that bone remodeling activity may be activated by PTH.